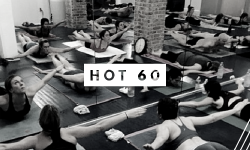 26 postures and 2 breathing exercises in 60 minutes. Suitable for all levels, including beginners. Classic 90 minute series of 26 postures and 2 breathing exercises. Suitable for all levels, including beginners. Hot Hatha Flow. Sun Salutations and postures that invigorate and enliven the body and mind. Releases tension and calms the nervous system. Suitable for all levels, including beginners. Fun and challenging flow to mobilize the entire body using heat and continuous movement. A slow burn that leaves you feeling serene, strong, and sparkling with energy. Open to all levels, including beginners. Warm and Restorative. Yin applies moderate stress to the connective tissues of the body to increase circulation to the joints and improve flexibility. Poses are held 3-7 minutes, with emphasis on breath and the meditative aspect of the pose, as well as calming the mind. Suitable for all levels, including beginners.